All of us are familiar with the expression of "Don't judge a book by its Cover" or "Looks can be deceiving" ... I would apply both 'saying' to this dish. "hmm.. nothing exciting about this dish ...its plain... not colourful...dark brown in colour.."
and eventually, we would skip to the next page or dish... and forget all about it. I was one of many that would judge a dish by how it is presented and colour... afterall the concept of "We eat with our Eyes first' do play a major part in our daily life... agree with me? Heat the cooking oil in wok and saute the onion pulp until golden brown. Add in the chicken and the bean paste. Mix well. Add in the grounded coriander, dark soy sauce, tamarind juice and the onion extract. Add in sugar and salt to taste.Add about 1/2 cup of water if the sauce is too thick. 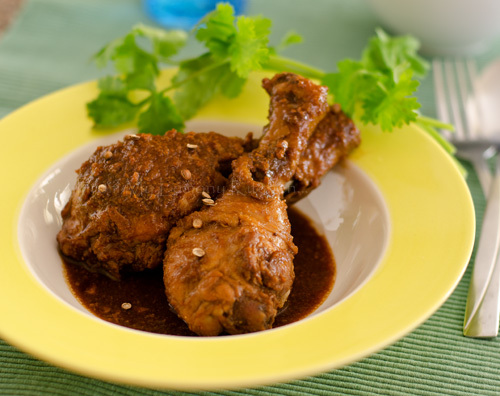 To serve, heat about 2 tablespoon of oil in frying pan, and fry chicken with some gravy until slightly brown. Do taste the sauce before adding salt (beanpaste has salt added). I can tell that this is dish is full with flavours!! I love this dish. Look can be deceived. I have cooked similar before and love it! Very appetizing dish. Thank you for dropping by my kitchen.. It is very appetising... and it tasted better the next day too, dont you think so? I don't think I've eaten this before but since I've all the ingredients in the pantry, I guess I'll definitely have to try this soon! It looks yummy and very very droolworthy - not brown and unappetizing at all! Yes, sometimes I "eat" with my eyes first... :-) just like looking/browsing at the cookbooks and it the colours of the food doesn't appetizing, I will skip and forget all about it. 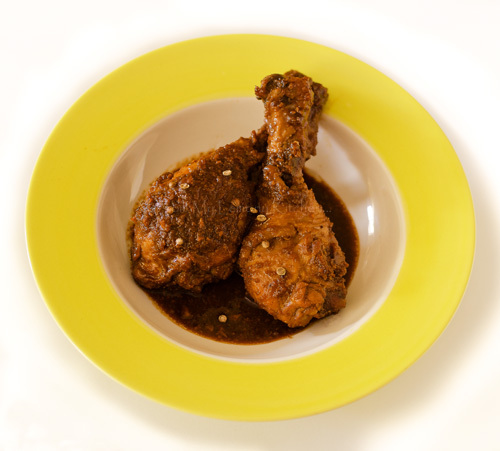 I think I will "brave" myself again to cook this Ayam Sioh. I really loves your Kari Kapitan soooooo much! Thank you lots and lots! !